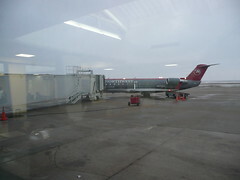 That's a Bombardier CRJ-200, powered by two General Electric CF34-3B1 turbofan engines. See Turboprop, turbofan. Good catch; I would've thought DC-9 or Fokker 100. But it's a Northwest Airlink bird, and the engines are all wrong for either the F100 or the DC-9... besides, the gear is too short for either of the bigger birds (no elevation on that baggage ramp cart), and only one over-wing exit, which speaks to the smaller number of folks inside. Tell me you googled the precise engine model. Wikipedia. Not even I am that big a plane nerd. The only airplane engine I know by heart is the SR-71's (Pratt & Whitney J-58 turboramjet) and only because my grandfather helped design it. As to the identification, the Fokker is easy to eliminate because Northwest doesn't have any Fokkers in its fleet. And it's not a DC-9 because (I had to click through to Flickr to see this) it has winglets, and the fuselage is too skinny. I thought Embraer at first but the tail section is a pretty clear tipoff that it's a Bombardier regional jet. My mistake. I had fans on the brain, because the next aircraft at that terminal was a turbofan. Flying a turbofan puddle hopper is a mistake I plan on not repeating.